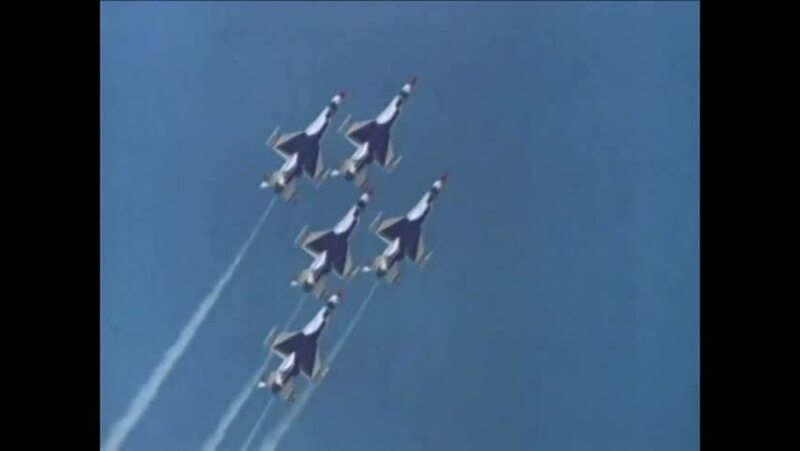 CIRCA 1986 - A narrator explains how the F-16 Thunderbirds got their name, while squadrons of the aircraft are seen in flight. hd00:161970s: Model airplane flies and turns upside down in air. Flaps adjust on wings as model plane turns upside down. hd01:31CIRCA 1949 - A YB-49 "Flying Wing" flies over mountainous terrain while a narrator describes some of its qualities. hd01:49CIRCA 1988 - After a U.S. Air Force helicopter crashes, the crew escapes thanks to their underwater egress training. hd00:571940s: The life cycle of the black widow spider is discussed in detail. hd00:45CIRCA - 1977 - Missiles are launched from F-16s in close-up. hd01:31CIRCA 1971- Military planes battle in the air, and a signaler directs aircraft onto an aircraft carrier.